Ennai kathirikkai kuzhambu - This is a famous chettinad Recipe.This is one of the best South Indian Recipe usually served with Plain rice.I love it with Fried Papad. 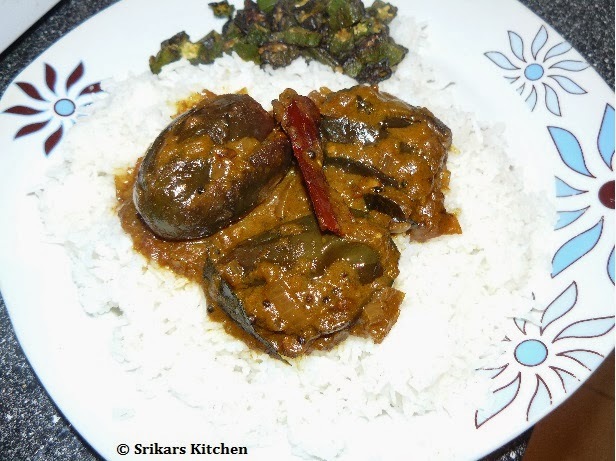 This is My Hubby's Favourite Dish.He Likes all version of Brinjal . 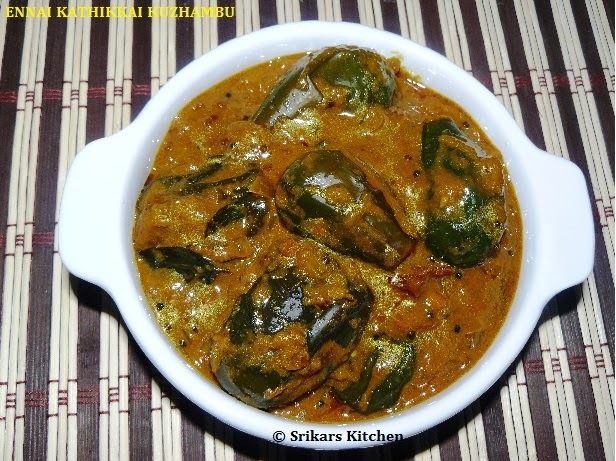 More Kuzhambu recipes check here. wash & trim the brinjals and slit them in criss-cross. Heat 2 tbsp oil in a pan, add brinjals & roast it & keep it separate. Heat oil in a pan, add mustard seed, channa dal. fenugreek seed & allow to temper. Add chopped onion & sauté. Blend the tomatoes &add to the onions. Add sambar powder,turmeric powder,salt & mix well. Allow to sauté until oil comes out. Add roasted brinjals . Soak the tamarind & squeeze the juice from it & add to the kuzhambu. Finish by adding little Jaggery & serve with plain rice. Super tasty and yummy dear! !